Speaking to the Financial Post during a visit to Canadian e-commerce firm Shopify, Cook cast doubt on the effectiveness of business models Amazon and Google are utilizing to spread their virtual assistant technology. Specifically, the Apple chief questions whether licensing Alexa and Google Assistant to third parties, then launching first-party products like Echo and Google Home, is a counterintuitive strategy. Apple, on the other hand, operates largely within the confines of its own walled garden. Siri is not licensed to outside parties, meaning Apple and only Apple can produce a smart speaker featuring the voice activated assistant. Like other Apple products, this approach grants complete oversight of hardware, software and services integration, presenting an opportunity to create a user experience from whole cloth. The approach has served Apple well; iPhone is a case in point. 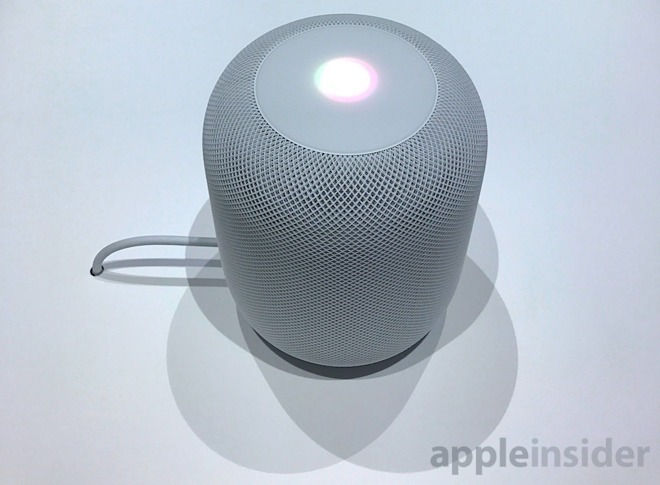 Cook went on to tout HomePod's sound quality, an oft-repeated refrain echoed by other executives and HomePod promotional material. "We think one thing that was missing from this market was a quality audio experience, a very immersive audio experience," he said. "Music deserves that kind of quality as opposed to some kind of squeaky sound." Some view Apple as being late to the smart speaker party. Amazon, which in many ways created and leads the space, continues to spread Alexa through third-party partnerships and devices of its own design. It was Alexa integration that dominated this year's Consumer Electronics Show, with hardware manufacturers baking integration for the virtual assistant into everything from speakers to shower systems. With Amazon clearly in the driver's seat, it remains to be seen whether Apple can convince consumers that sound quality and a premium user experience trump Alexa's wide array of service integrations and lower hardware price points. HomePod goes up for preorder this Friday with initial shipments due to arrive on Feb. 9.